5. 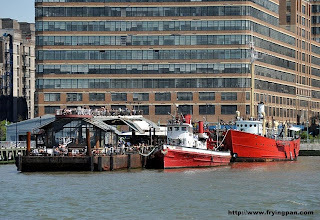 Outdoor Waterfront Bars - Two great places to spend a sunny day with some friends, food and drinks are Pier 66 Maritime (more commonly known as the Frying Pan), and The Boat Basin Cafe. The Frying Pan/Pier 66 Maritime is a barge on the Hudson and adjacent sunken ship that was raised and now serves as a venue for bar and restaurant. It's a very casual place that's always packed on sunny summer eves and weekends. Their pitchers of sangria, buckets of beer and platters of food are great for groups. As a bonus, you can tour the boats which have been restored to its 1929 look. The Boat Basin cafe has a similar atmosphere, great for groups on a nice day. It sits adjacent to the Hudson River in Riverside Park. You can sit at a table outside or hang out at the bar underneath an overpass - which actually is much cooler than it sounds. As I was writing this, I saw Gothamist had a similar post here. 6. Free Kayaking in the Hudson - if you are looking for some water sports action, try some kayaking and you don't need to go very far. The operators make you stay pretty close to the shore, but it's still a neat feeling to see the city from right on he water. Just make sure it has been a week since the last heavy rain. In case you didn't know during heavy storms, the combined sewer overflows in to the rivers - that includes sanitary flow! Gross. (There's some of my civil engineering dorkiness melding into the blog). Just some more Shariously great ideas for the summer!